Himalaya Engineering Company, an ISO 9001:2008 Certified Company, one of the leading manufacturers, suppliers and exporters of this impeccable range of Road Construction Machines, established its operations in the year 1997. The range made up of the finest Asphalt Drum Mix Plant, Paver Finisher and Wet Mix Plant, is widely praised and preferred in the market. Its manufacturing is done following the set industry norms and guidelines, utilizing the finest raw materials and modern technology. This ensures the product’s strength, performance, capacity and service life. Further, the range is marked at the most reasonable rate possible. We are exporting in Bhutan, Iraqe, Africa, Pakistan, Iran and Afghanistan. The highly advanced infrastructure, laced with all the necessary machinery and equipment, help us in the attainment of several of the firm’s predefined goals and objectives. For attaining a better position in the market, the facility is regularly upgraded. We have parted the facility into several highly operational units, for reasons of managing the operations of the firm, in the smoothest possible manner. Further, these units help us in the maximization of productivity and revenue generation. In addition to this, our ethical work practices have helped us attain reputed clients like H. S. Mehta and Akash Infrastructure. Under the able governance and guidance of our CEOs, Mr. Rameshbai Rajput and Mr. Amrit Bhai Rajput, we have managed to attain a number of the firm’s predefined goals and objectives. Their skills, experiences and understanding of the market, have been nothing less than assets to us. Further, he provides regular perks and benefits to the employees, for reasons of employee satisfaction. Manufacturing and Trading of a wide range of Road Construction Machines such as road pavers, drum mixers, drum concrete mixer, asphalt paver finisher, wet mix macadam plant, bitumen distributor truck. Making rapid progress in the road construction industry, we are completely focused towards offering best quality machines to our clients. In order to meet the increasing industrial challenges, we incorporate the new and advanced production techniques. Through our constant innovation program and intensive R&D, we have are committed to find new and better ways of fulfilling our customer's needs. 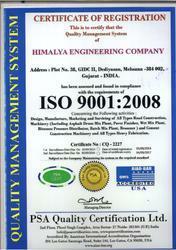 We at Himalaya Engineering Company, consider quality to be of top priority. Thus we utilize quality raw materials and advanced equipment, as per the set industry norms and guidelines. This ensures the offered range’s performance, capacity, strength, functional life and user friendly nature. To make available highly standardized products, we send thee products for a number of highly stringent quality examinations, where with high level of precision, all manufacturing defects are eliminated. Our team has been an important strength of our success. Our team comprises of experienced engineers, marketing managers, R&D specialists, quality experts and packaging specialists. We also have a number of technical staff who function as helping hands to the engineer to carry out various production process efficiently . Experienced and competent, our engineers are capable of executing the different prestigious projects efficiently within the lead time. Our engineering wing regularly design and develop superior designs and can easily manufacture machines that meet the required specifications of the clients. Our team of highly skilled and experienced professionals at Himalaya Engineering Company, work in a single direction, to attain a number of the firm’s predefined goals and targets. These professionals are recruited based on their ability and willingness to work. To manage the team’s operations in a highly efficient and effective manner, it has been parted into several highly operational units. The division of the team is commenced, based on their area of expertise. Further, these units direct their efforts, towards maximization of productivity. We are amongst the leading manufacturers, exporters and suppliers of this impeccable range of Road Construction Machines. In order to live up to this reputation, we follow the guidelines defined by the industry and utilizing the finest raw materials and modern machines. This ensures the product’s performance, service life, strength, precision, capacity and user friendly nature. Further, the range is priced at the most reasonable rate possible, is packed in a highly commendable manner and is delivered with high level of punctuality.